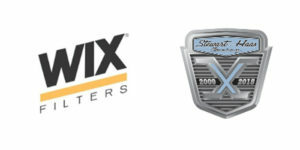 WIX Filters will serve as the primary sponsor of Clint Bowyer and his race-winning No. 14 Ford Fusion during Chicagoland race weekend, with WIX Filters represented on Bowyer’s car and firesuit. Bowyer is the most recent SHR driver to deliver a win for WIX Filters. The 13-year NASCAR Cup Series veteran from Emporia, Kansas, scored his ninth career victory and his first with SHR when he won March 26 at Martinsville Speedway in Virginia. The victory was SHR’s fourth this year, the most of all NASCAR teams. The 2018 season marks SHR’s 10th anniversary, with the organization having won two NASCAR Cup Series titles (2011 and 2014) and 47 races since debuting in 2009. Bowyer has made 12 career NASCAR Cup Series starts at Chicagoland, with a best finish of fourth in 2010. He is currently sixth in the championship point standings with two top-five and four top-10 finishes. His Martinsville victory punched his playoff ticket, making Bowyer championship-eligible for the sixth time in his career. For more information on WIX, visit wixfilters.com.